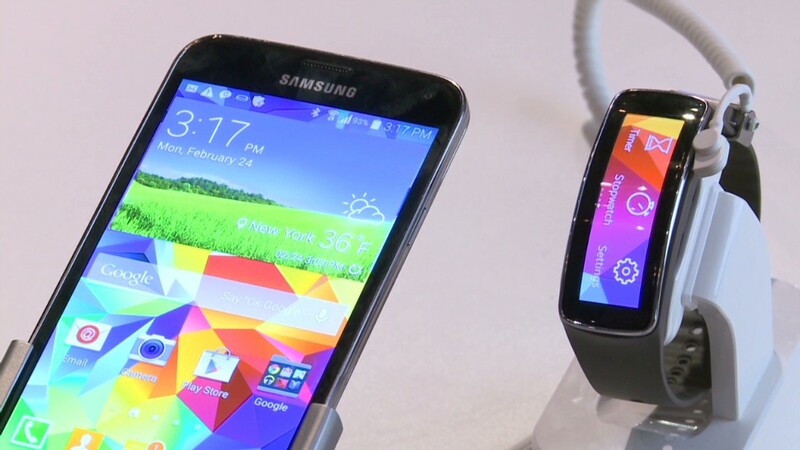 The Samsung Galaxy S5 probably isn't the reinvention of the smartphone. But unlike last year's Galaxy S4, there's a good chance some of the new features announced could be of actual use to normal human beings. Of course, a few minutes with the Galaxy S5 wasn't enough time to reach a full verdict on the phone, but it was enough to get a basic feel for what Samsung's (SSNLF) latest offering can and can't do. The 5.1 inch display has the same 1080p resolution as last year's 5-inch screen, but due to some new technology, it's definitely brighter, which at the very least, makes everything look nicer. And according to Samsung, the special technology which makes that screen brighter also improves performance in direct sunlight. At the expense of your battery, of course. Like the iPhone 5S, the fingerprint scanner is probably the most eye-catching of the new features, which adds an extra level of security and/or convenience to the device. While it does require you to swipe your whole finger pad over the sensor (unlike the iPhone, which simply lets you place it on the sensor), it worked smoothly the few times I was able to use it. Samsung's new phase detection auto-focus means that the camera is now capable of a nice blur effect in the background when you photograph an object up close. The shutter was reasonably fast with bright indoor light, though it did seem to have trouble handling a couple of weird lighting situations and slowed down considerably. How much the image quality has or hasn't improved over the S4 is still to be determined, however. There was no way to really test how worthy the water and dust-resistant features were (save for dumping a bottle of water on it? ), but if the weatherproofing is half as good as Samsung claims it is, everyone wins. The hardware design of the phone isn't much better, or even different, than it has been in years' past. If you like it, you like it. (I don't.) The texture and material used on the back is much improved and makes the phone feel less cheap when you're holding it, but the colors to choose from are mildly depressing. And when it comes to size and pocketability, at this point, everyone should already know what they're getting into when they buy a 5-inch phone. The Galaxy S5 is big, but it's not completely unwieldy. Samsung's TouchWiz UI is back in its same fundamental form, but it does look better, visually speaking. Fonts and icons generally look cleaner, but everything is still organized in the same manner as past TouchWiz iterations. That said, it doesn't seem like a huge improvement over anything offered up by the likes of Google (GOOG), Apple (AAPL), Nokia (NOK), or even HTC. And Samsung still hasn't done much to improve the experience running two apps side-by-side. I mean, I guess it's cool Samsung put this on the phone? It doesn't detract from anything at all, but this sensor definitely seems more useful in its new Gear Fit wearable. At the very least, many of the features included in the Galaxy S5 have more potential than the new features included in last year's model. To what extent that potential is realized will take a little more hands-on time however.